Ultrasonic coating technology has replaced conventional coating systems in a wide range of industrial and R&D applications, and enabled spray processes that would otherwise be impossible. Compared to many other coating systems, ultrasonic spray nozzles are more precise, more controllable, more repeatable, and more environmentally friendly. The unpressurized, low-velocity spray is easily controlled and significantly reduces the amount of overspray since the drops settle on the substrate, rather than bouncing off it. This translates into substantial material savings and reduction in emissions into the environment. The nozzles are inherently non-clogging, self-cleaning devices due to continuous ultrasonic vibrations and their relatively large orifice. Sono-Tek’s ultrasonic spray nozzles are fabricated from titanium for long life and excellent acoustical properties. Visit How Ultrasonic Nozzles Work for more information about this unique spray technology. Ultrasonic spray nozzles open up a broad range of new application possibilities. The nozzles are ideal, for example, when extremely low flow rates are required. 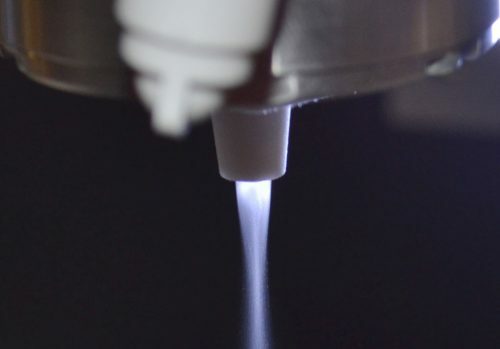 And they offer unique benefits when spraying particles in suspension, keeping particles evenly suspended during the entire spray process through the ultrasonic action of the nozzle itself. This results in more uniform dispersion of functional particles in thinner layers. As shown in the drop comparison chart above, ultrasonic spray nozzles have a much tighter drop distribution than pressure nozzles. This translates into more uniform coatings achieved with thinner layers and very little overspray. Significant savings in spray material, as well as reduced exhaust requirements and improved process efficiency are additional benefits.